​2017 WAS A FANTASTIC YEAR FOR ENDLESS TRAILS. With your help, we were able to do more trail work, and raise more money for Northwest trails, than in any previous year! That's HUGE, and we're so grateful/psyched to keep this momentum moving forward. 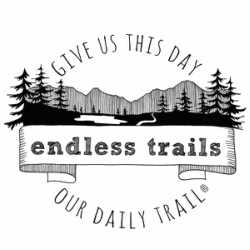 We have lists upon lists of trails we want to see, trails we want to explore, and trails we want to help improve. We also know we're not the only ones who love trails. If you have a favorite trail you love that might need some work and/or funds, we'd love to hear about it. If you have a trail you'd love to help us advocate for or work on, we'd love to hear that, too! We're still finalizing our 2018 itinerary, but as it comes together, you can expect it here. We'll also be sharing more details about upcoming projects, adventures, and trail work dates as we have them! In the meantime, you can read about everywhere we went in 2014, and everywhere we went in 2015, and everywhere we went in 2016. You can find our 2017 trail work and project recaps here, here, and here. If you want to know about more upcoming trail work opportunities, go here, or email us! End-of-the-year recaps, + prepping for a bigger & better 2019! If you'd like to meet up with us on the road, sponsor/support any Endless Trails endeavors/events/trail work dates, or have questions or comments, you can reach us here. We'd love your input & appreciate your support.